When Elizabeth first contacted me, I was surprised. She heard about me and my cakes, through her friends who ordered from me before. Not having tasted my bakes, she went ahead and ordered not 1, but 2 big birthday cakes for her 2 boys. Truth be told, I was apprehensive. Elizabeth wanted hummingbird cake but I didn't know how to make it. I felt bad. At the end, she said chocolate and vanilla in separate tiers were just fine. I am so fortunate to always meet lovely customers. We discussed in detail and finally nailed down the design for the 1st birthday cake. 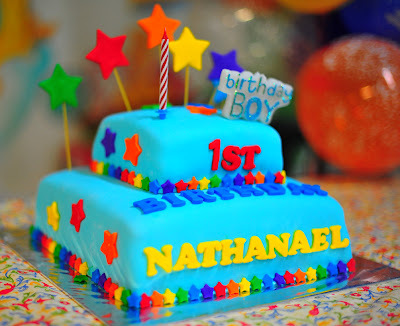 The first cake was for Nathanael. He likes bright colours and stars, hence the use of all the colours of the rainbow (with the exception of indigo!) and generous use of fondant stars for his cake. Elizabeth wanted a 2-tier cake as there would be lots of guests as it was a big 1st birthday bash at an indoor playground. To add the wow factor, I used spaghetti sticks to hold up the big stars. I avoid using florist wires as it is not food-safe. This is the back view of the cake. and the many stars on it too! The guests liked the cake too! in her blog post on Nathanael's 1st Birthday.